I remember I was using MOSS before and this is possible by using by connecting to another library like how it was disucssed in this blog http://sharepointgeorge.com/2009/display-sharepoint-list-site-data-view-web-part/, but now I had changed jobs and I am implementing the free version first which is the Sharepoint Foundation 2010 which have lesser functionalities than MOSS and one of it is displaying a SharePoint List from another team site. 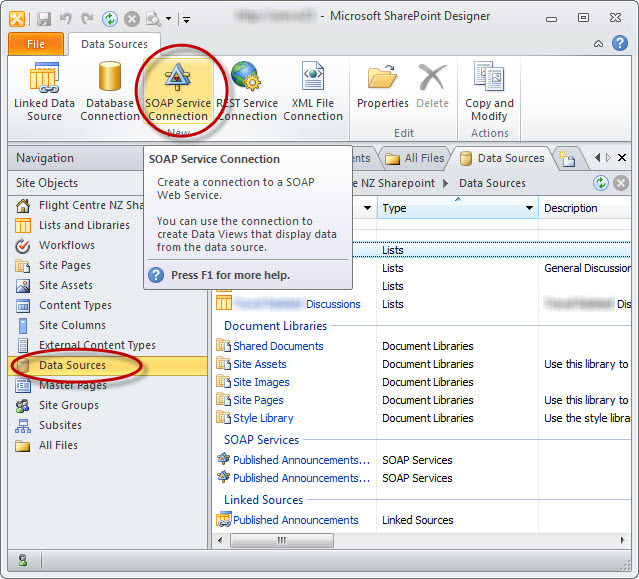 The Sharepoint Foundation is locked down to display list data sources from the same team site but thanks to the Sharepoint webservices there is a way of doing it. Now what we need here for this sample is the http://ServerName/_vti_bin/Lists.asmx. Also in my sample I had created a filtered list so that anything that is ticked “publish to root” will be the only ones displayed on the list you want to compile. 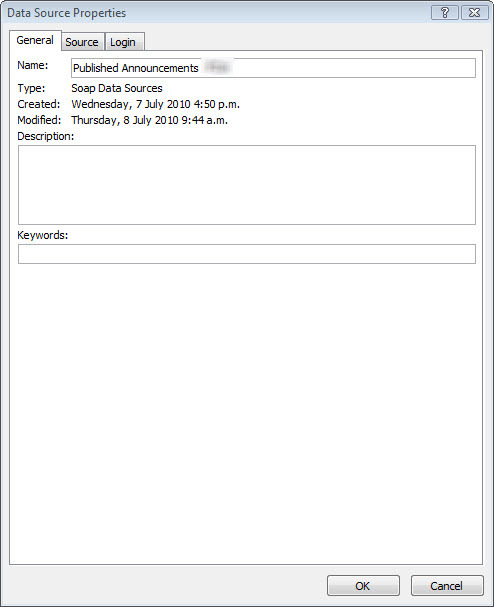 This is a good way of separating your team site with the public site access, thus making the management of your announcements in one location and preventing giving access to users on your team site. Note: Thats is not a built in column and you have to manually create it. 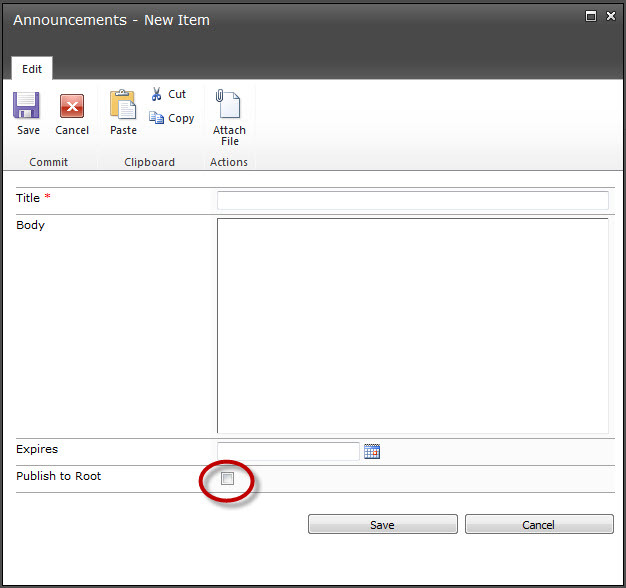 Now from there you can now create your filtered list, here is the step by step process. 5. Now your view is ready, click on it to view its List and View ID. 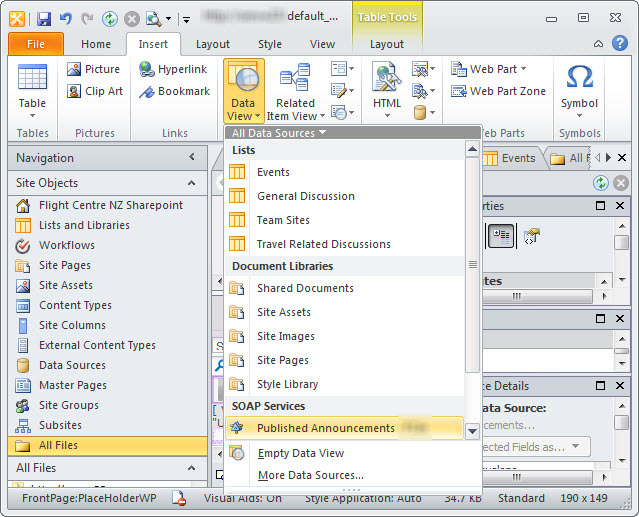 Now your everything is set up interms of your list data source, you need to now create your data source on Sharepoint Designer. Fire up Sharepoint Designer and connect to your team site. Now go to Data Sources and click SOAP Service Connection, then you can now define your Data Source. Parameters : You need to fill up only listname and viewname and this is the one you had taken note a while ago. And define Security Context on the Login Tab. Note: This is important as they security user that you will assign here should have access to the specific list thats why we havent used the Windows Authentication as it defeats the purpose of the one I discussed above (the two level announcement publishing) or you dont want to manage each users access to have view on specific List View. 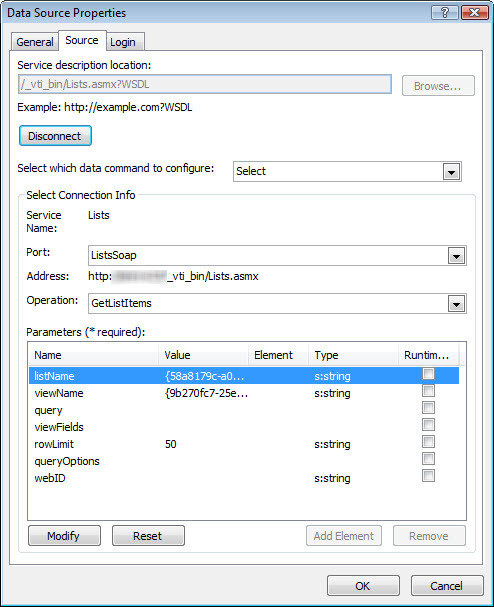 Now go to any page you want to place your data view by clicking data view and choose your created SOAP Services Data Source. Now the list will now show on the page but you still have to clean it up as it will be in its raw form, like title will have “ows_” prefix on it, the Body is formatted to text (you can format it to rich text like the one below), the author have some extra characters that you need to clean as well (you can do it by modifying the field to <xsl:value-of select=”substring-after(@ows_Author, ‘#’)” />, so it removes that extra characters). 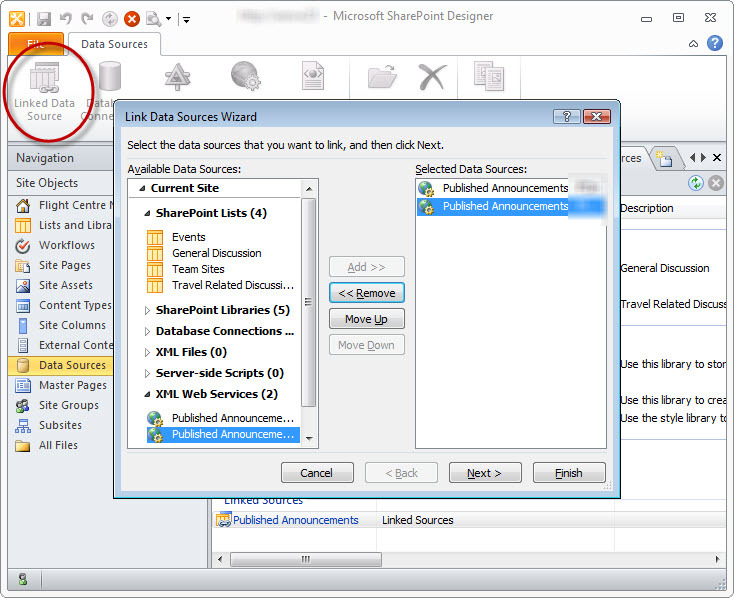 Another trick that I can share is that you can also merge different list you want to publish for example from multiple private team sites into the root sharepoint site by using the linked data source and choose any list you want to merge and join together into one data source. Any ideas..? I have created another View just in case but this did not appear to be make any difference. The error message is really not helpful but that is given as by default thats how Sharepoint presents it to you. You need to turn of Verbose errors so we can see the real problem then we can start debugging. To do this you nee to edit your web.config file which is located by default in C:InetpubwwwrootwssVirtualDirectories80. Back up your web.config before doing some changes. SafeMode MaxControls="200" CallStack="false" DirectFileDependencies="10" TotalFileDependencies="50" AllowPageLevelTrace="false"
Change the CallStack="false" to CallStack="true"
Thanks so much for your response above. I did as suggested above and changed the web.config file and did an iisreset (I even did a server reboot) and tried to add the data source again but the error is exactly the same – no more detailed error in SPD. 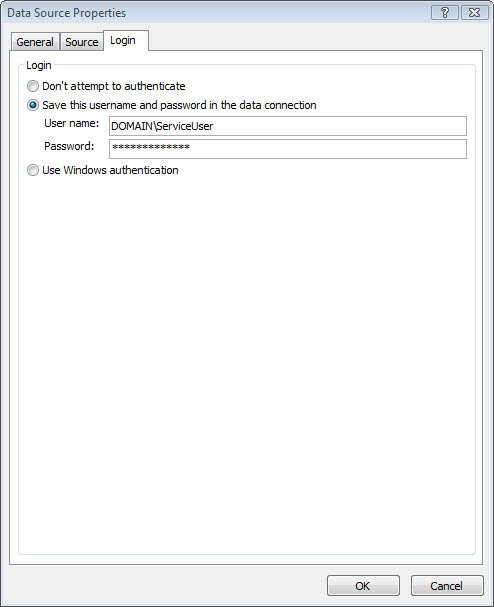 Have you tried Windows Authentication? If you can try them first so we can eliminate the possibility of Authentication Error. I have a better way to achieve this without using SOAP service connections. I tried Windows Authentication but this unfortunately does not make any difference. Is it also possible to create the link and get the silverlight box just as an announcement in the normal standard view / list? Sorry I quite did not get your question , can you elaborate further? In the normal announcement lists you have the title that is clickable, then there is a pop-up that displays the announcement (like the body text). I did follow your guide and now i can get an copy on the other site, but i want it also to be clickable like on the normal announcement list. 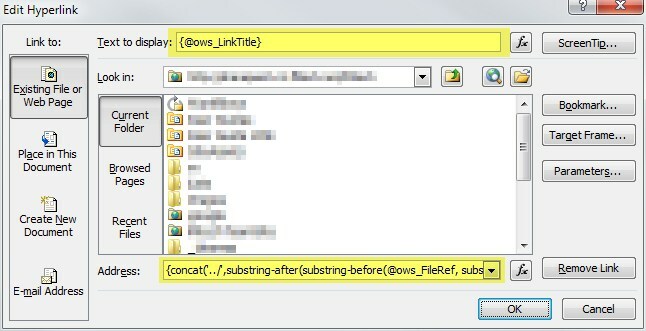 Yes you can just interpret the row on the datasource called ows_FileRef as a hyperlink your needed info will be in that row. Thanks for the info, but i’m getting an error some ‘ isnt closed? I’m no programmer so i’m a bit confused what isnt closed and what is. Do i also need to replace the # with a value? Hi, I got the same problem, what you did to fix this issue? Ok got it to work, but is it also possible to make it like a Silverlight box as the normal announcement list? What do you mean Silverlight box? I am seeing some odd behaviour when I render @ows_FileRef when I pull in List data from a document library on another site collection in DVWP. This of course will give an error. 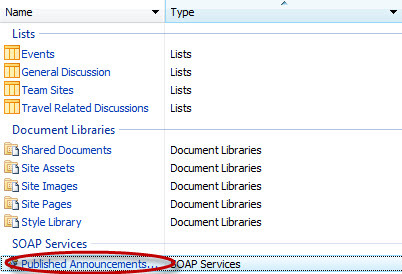 So why is SharePoint prefixing the file in DVWP with the current location not what is passed back from my datasource. It is drving my nuts. Here is what I had done. This worked like a charm for me…thanks a lot. Using the code above, I was able to display the link on my DVWP. 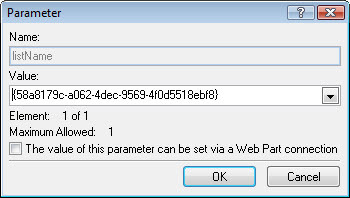 In SPDesigner no value or link appears in the cells, but when I open DVWP on my site it shows the link to the document. Is it possible to display a customized “New Item Form” of a Survey located in a Subsite on the Top Site? (Actually, what I have is a subsite with polls (using the survey list with 1 question and a few options. You can but you have to do some programming using Visual Studio and create a web part from scratch.